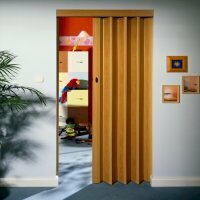 Rapid folding door in wood imitation or white ash look (replica). One door package is enough for a door width of 88 cm, the door height of 205 cm can be shortened to any size. There is a panel in the same look to match any door; it is as an attractive cover to add an appealing touch to the slide rail. Colour : White Material : Plastic Properties: One wing door: Can be fitted to open left to rig..
Colour : Oak Material : Plastic Properties: One wing door: Can be fitted to open left to right..